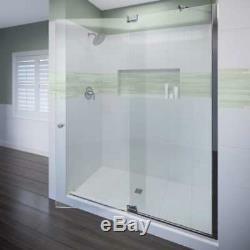 Miseno MSDF4876 76" High x 48" Wide Hinged Frameless Shower Door with Clear Glas. Note, Images may included different finishes & other products not included in listing. Constructed of durable 3/8 thick tempered glass. A frameless design gives a modern, sleek look to the shower. Hinged shower door operation gives an impressive look to any shower unit and gives the feeling of more space as you utilize the shower. Door opens to the left or right depending upon installation configuration. Shower door allows for up to 6 of adjustment. This is a shower door only â?? A shower base and walls may be required to complete unit. Failure, Incompetence, Accident, Screw-Up, Calamity or Oversight. Cut the header a bit too short? You're not the first. With customer service being our number one priority, we created the F. Program to better assist our customers. Our program applies to head rails, bottom tracks, and thresholds that have been cut incorrectly. Our customer service team will work with you to resolve your issues. Offer applies to a one-time replacement per customer per installation. Overall Height: 76 (bottom to top). Overall Width: 48 (left to right). Build is the second-largest and fastest-growing online home improvement retailer. At Build, our goal is to provide the best selection, pricing, and unmatched customer service. Our store has quality home improvement products from trusted manufacturers like Kohler, Moen, American Standard, Delta, Kraus, Kichler, Progress Lighting, Schlage, Kwikset, Baldwin, Broan, NuTone, Air King, and Rev-A-Shelf. Build is part of the Build Network of Stores which includes Plumbing, Lighting, Ventilation, Hardware & More. If your order is received before 11 A. Plumbing faucets, bathtubs, toilets, sinks, etc. Hardware door knobs, door levers, hinges, cabinet pulls, etc. Tools power tools, air tools, generators, etc. To fulfill orders and more information can be found on our FAQ. Qualifications for a general return. You may opt-out of receiving a PPL or BOL by contacting our customer service team (detail above). If you opt-out, then you must provide us with valid tracking information to receive your credit and avoid processing delays. Cancellation requests must be processed by a customer service team member. Yes, you will receive multiple tracking numbers. Yes, but you must add all products to the cart before checking out. If you do not add all items to the cart you will not get a combined rate. It is your responsibility to know if a product will be compatible for your country. We cannot offer advice if a product will work for your country or application. We will not replace glass if is arrives damaged. I live outside of the US, will the product work for me? We cannot give advice on compatibility since we do not know all the building codes, regulations and standards for all countries. Distribution center where the product is in stock. This listing is currently undergoing maintenance, we apologise for any inconvenience caused. The item "Miseno MSDF4876-CH 76H x 48W Hinged Frameless Shower Door with Clear Glass" is in sale since Saturday, December 8, 2018. This item is in the category "Home & Garden\Home Improvement\Plumbing & Fixtures\Shower Enclosures & Doors". The seller is "buildinc" and is located in Waterloo, Iowa.